THE award winning Eclipse Cinema in Downpatrick is gearing up for another action-packed year and is leading the way in providing the best cinema experience possible with the help of none other than the Walt Disney Company and friends! The cinema has just celebrated its fourth year and manager Roisin McManus is delighted to announce that business is booming with almost 800,000 visitors since the doors opened in June 2009. Delighted with these healthy statistics, she said: “This year has been the most exciting so far with the installation of the incredible 4K technology across all of our studios. Last year Eclipse Cinemas launched their electronic loyalty scheme, offering rewards to their customers in the form of free admissions, drinks and snacks. This has been a massive hit, with over 2,500 customers already enjoying the benefits. The Downpatrick Eclipse management team pictured outside the Walt Disney shop in Grafton Street in Dublin during a recent visit. 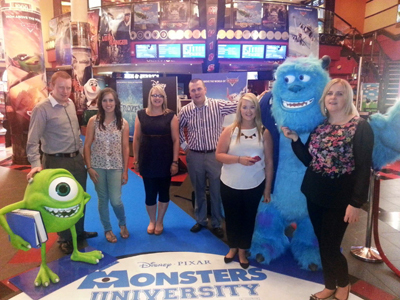 And last week the team team at Eclipse was invited to Dublin to find out all about the amazing new movies that the Walt Disney production company has lined up for 2013-2014. After exclusive screenings of the upcoming blockbusters ‘The Lone Ranger‘ (to be released 9 August 2013) and Disney Pixar’s ‘Planes‘ (which lands in cinemas 16 August), the team enjoyed a fun-filled afternoon of teasers for some of the most exciting movies to ever hit the big screen. THE Eclipse Cinemas in Downpatrick is the first fully equipped Sony 4K cinema complex in Ireland. The Downpatrick Eclipse cinema is part of an Irish independent cinema group which have had 12 Sony 4K projectors installed across two of its three venues, Bundoran in Co Donegal and Downpatrick in County Down. These will also be equipped with the Sony 3D solution, allowing cinema-goers to enjoy the best possible picture quality and entertainment experience. Downpatrick Business Development Manager Daniel Barrett said following the Dublin visit: “The installation also means Eclipse Cinemas now has the ability to offer new services beyond traditional mainstream content, such as viewings of comedy, sports, music, theatre, opera, multi-user big screen gaming and cultural events. The organisation already plans to screen live Irish sporting events such as Six Nations Rugby, International Football and Gaelic Games, offering customers an alternative solution to watching it at home. It will bring a taste of atmosphere and occasion right inside the cinema. 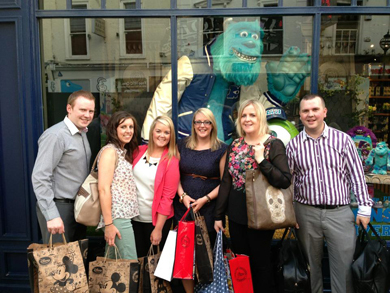 The Downpatick Eclipse management team in the Walt Disney shop in Dublin meet some quaint characters. The Downpatrick cinema complex is part of a family owned business. There are three cinemas in the Eclipse chain – Bundoran, Lifford/Strabane and Downpatrick, with a grand total of 19 Screens. It was the ambition of the founders to bring City Style cinemas to smaller towns, with the extra attractions of a warm welcome and high quality customer service one associates with a family-run business. Daniel added: “The Eclipse Cinemas brand was created by a Primary School pupil for a “Name Your Local Cinema” competition. The winning concept was, “When you go into a studio it is bright, then the lights go down and the film starts. At the end the lights go up again, just like during an Eclipse”. “We have a number of interior design features in Downpatrick such as our foyer carpets incorporating the Eclipse logo which cinema goers find very attractive. The first Cinema to run under the Eclipse name opened in 2008 in Lifford/Strabane which was formally called Lifford Strabane Cineplex. The former Bundoran Cineplex then became Eclipse Cinema Bundoran in 2009 along with the brand new Eclipse Cinemas Downpatrick. Eclipse Cinemas have won two awards recently. What is Sony 4K Digital Technology? Sony Digital Cinema 4K technology allows viewers to experience exceptional picture quality from every seat in the cinema, providing world-leading ‘easy on the eye’ 3D images with and spectacular detail even on the largest screens. Transforming the cinema experience, Sony Digital Cinema 4K technology gives the consumer an immersive, engaging visual experience you simply can’t get at home. It provides over four times the resolution of an HD TV or the previous generation digital cinema (2K). It has captured the imagination of audiences and the cinema industry alike, winning the commitment from Hollywood, as evidenced by 4K releases from studios such as Paramount, Warner Brothers, 20th Century Fox, and Sony Pictures. The 4K technology has also won commitment from Hollywood heavyweights such as Christopher Nolan (“Dark Knight”, “Inception”), Phillip Noyce (“Salt”) and Ron Howard (“Angels & Demons”), who have all released their most recent blockbusters in the 4K format. Sony is the only manufacturer currently deploying a 4K projection system in volume.